It is our constant endeavour to minimize downtime, decrease the cost of service and to address the concerns of our customers. in every nook and corner of the country. We also have a Customer Assistance Center which is operational 24x7 with a toll free no - 1800 209 7979. 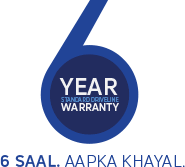 It provides assistance on Sales/ Service/ Product related issues and ensures spare parts availability to all our customers in India.